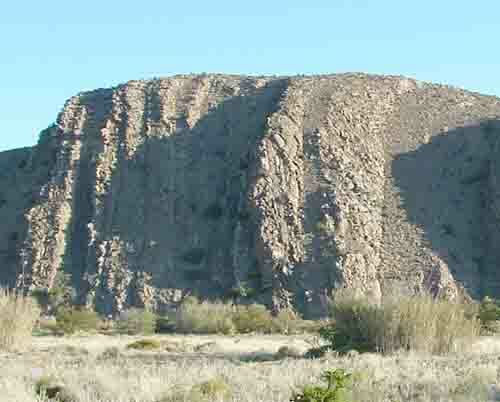 The Little Karoo is a geological basin about a two and a half hour drive from Cape Town. It measures about a 100 kilometres in width and 300 kilometres in length and lies between the Swartberg mountain ranges to the north and the Outeniqua and Langeberg mountains to the south. The mountains around the basin are folded mountains and are made up of red/orange sandstone and mudstone which were laid down about 300 million years ago. Travelling through the mountain passes the rock formations exude colours that will remind travellers of the dying embers of a fire. In earlier times the Hottentot tribes who roamed through the area gave it the name of Kango which means a plain between the mountains. Early explorers called it Gannaland after the Salsola plants which were called “ganna” by the Hottentots. Ganna plants made up part of the diet of the large eland antelope which roamed the Little Karoo and because of this the Hottentots called the eland “ ganna” as well. The Little Karoo is full of spectacular ravines and has a number of rivers flowing through it, the largest being the Olifants river . From its source in the Great Karoo the Olifants river meanders through the Swartberg mountain range by way of the Toorwaterpoort and then enters the Little Karoo. The Toorwaterpoort (pass of bewitched water) is rather interesting in that it has a hot water spring gushing water out of the base of the Swartberg at a rate of 1.2 million litres a day at a temperature of 45 degrees centigrade. Also emanating from the mountain are subterranean gases which often catch fire and cause the local communities to worry that the burning gases will cause volcanic explosions. Once through the mountains the Olifants river gathers water from streams running off the mountains and continues to flow westwards where it joins up with the Gamka river. The Olifants river has twelve main tributaries all of which assist in the draining of the Little Karoo and all flow through their own fertile valleys. Eventually the combined rivers flowing out of the Little Karoo through the Langeberg mountains become known as the Gouritz River. The Little Karoo has a very dry climate (semi desert) but in fact has plenty of water which it hides under a cloak of aridity. In spring after the winter rains the plain becomes a wild flower paradise where there is a profusion of colour as the wild flowers show off their beauty. Not only has the Little Karoo got beautiful flowers but it also has 24000 ha of top quality soil in which tobacco, wheat, grapes walnuts, lucerne and potatoes are grown. Livestock such as the ostrich does very well in the Little Karoo. Before the Little Karoo was discovered by the European explorers it was inhabited by Hottentot and Bushman tribes who used to live in the caves in the mountains surrounding the plain. The Bushmen tribes were avid painters and today one will find hundreds of Bushmen paintings on the walls of caves and rock faces in the mountains. With the arrival of the European explorers who entered the Little Karoo through a pass today known as Cogman's Kloof a number of towns grew up in the area. The first town was that of Montagu which was built on the northern side of Cogman's Kloof and is today the start of the well known Route 62 through the Little Karoo. As the plains offered good farmlands and were full of wild animals the explorers soon settled down and built homesteads in the area. Over the years a number of towns have been established with the largest being Oudtshoorn which has become the centre of the ostrich farming industry of the Little Karoo. 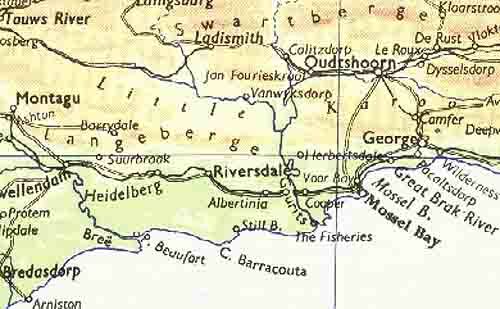 Other towns such as Calitzdorp and Ladismith have also been established over the years. Route 62 through the Little Karoo has become a well known tourist route over the years and is an area one should not miss when visiting the Western Cape.